Now includes free e-Book! Learn about laws that can affect your dental practice and strategies to help avoid costly and time-consuming legal challenges. A Dentist’s Guide to the Law discusses legal issues that can arise concerning practice formation, marketing, employment, privacy and data security, disability access, contracts, antitrust, insurance, collections, reimbursement, patient treatment, and more! The user-friendly Q&A format provides easy access to information that can help you stay in compliance with applicable laws. • How do I dismiss a troublesome or threatening patient? • Can I charge interest on overdue dental fees? • What are some laws that affect my practice website? • What can I do about a negative online review? • What should I do if a law enforcement official asks for information about a patient? • Can a dental practice use surveillance videos? • What are some legal considerations when selecting an electronic dental record? • What are some risks of hiring someone who has been “excluded” from Medicare? • When can a patient bring a service animal into my dental practice? 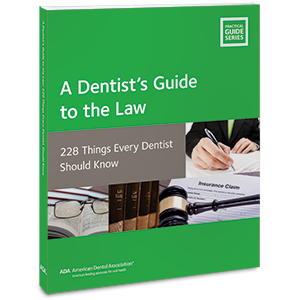 The ADA Division of Legal Affairs developed A Dentist’s Guide to the Law in response to questions that members have asked over the years about laws that apply to dental practices. Updated to include information about recent legal developments, A Dentist’s Guide to the Law includes information on topics such as the Physician Payment Sunshine Act, website accessibility, online ratings sites, and the Children’s Online Privacy Protection Act (COPPA). Also contains sample agreements concerning associateships, independent contractors, practice website development, and HIPAA business associates.